No, not that metal community. 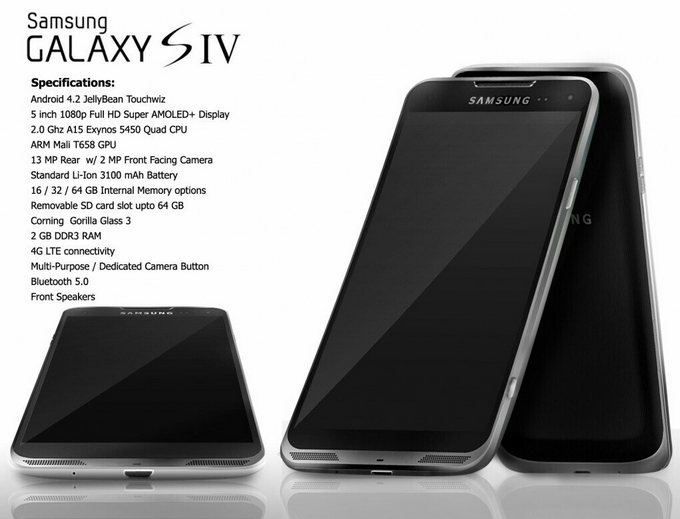 Recently, a new “render” of Samsung’s next flagship device, the Galaxy S4, was released to the Internet. We can pretty much say that this is not the phone, but it does suit itself as a nice conversation piece that would look lovely on my coffee table. Not only do we get to dissect the look of the actual device, but we get to look at all of those pretty specs at the same time. We will list the specs below, and then offer up why or why not this will work for the Galaxy S4. So, let’s get the quick ones out of the way. Android 4.2 “Jelly Bean” is hopefully a given at this point, since it has been out for almost a year now and Samsung will no doubt want to launch the device with the latest version of the Android OS. TouchWiz UI is of course, also a given. We have heard that Samsung would incorporate their new Exynos 5 Octa chip into the S4, but maybe it’s not ready for release? Given we are expecting this phone sometime in Q2, it’s hard to imagine that we wouldn’t see their newest SoC technology come aboard this device. So, let’s scratch the 2GHz 5450 quad-core for now. A 13MP camera would make plenty of sense, given all OEM’s are currently in the process of upgrading their sensor offerings. We know HTC has something big planned, as well as Motorola, who has been sort of absent in that department in terms of picture quality. The one spec on here that I am really hoping for is that 3,100mAh battery. We can’t enjoy these overly-powerful devices for a full day if we don’t have a sufficient power supply. That size, coupled with some battery-friendly technology from either the Octa or this Exynos 5450 would suit it well. Not that there isn’t already a manufacturer throwing huge batteries in phones, see Moto’s RAZR MAXX HD, but I think you know what I mean. HTC has been throwing in rather puny batteries in their devices for sometime and it’s starting to become an issue for potential buyers. The two “specs” on here that rub me funny are the dedicated camera button and the front facing speakers. Samsung has been fortunate enough to find a design that sells to the public, thanks to millions of dollars in advertising, but the S3 sells nonetheless. I wouldn’t expect to see huge changeups in hardware design if Samsung wants to keep their buyers happy. To see this example in use, see Apple’s iPhone. People aren’t looking for drastic hardware changes. I think Samsung knows this and we can expect to see back-facing speakers on the S4 as well as this camera button being omitted from their design. Plus, the above image does give off a metal look. It should be safe to say that metal won’t be found on anything Samsung unless it’s a washer and dryer. As always, this is me just rambling and I would love to hear what you think of this render. Again, just to clarify, we by no means think this is the device. The phone itself looks quite nice, so let’s hear your thoughts down below.